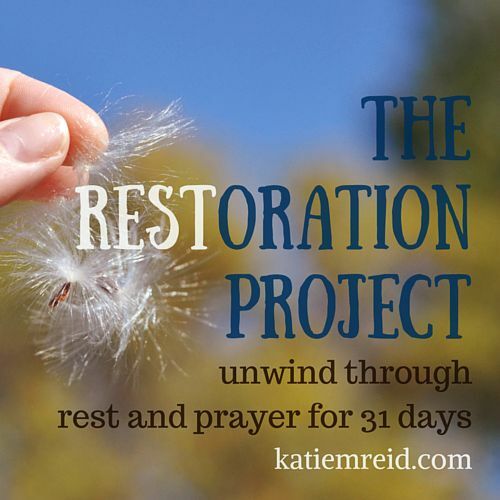 Welcome to Day #21 of the Restoration Project. It’s been a long day. I got less done that I wanted. My energy seemed to fly out the window around 5pm, like I wish this crazy fly swarming ’round my head would do. The toddler keeps getting out of bed and my resolve to discipline has been suffocated by tiredness. I know You give us rest, but how about a maid, cook and nanny every once in awhile too? I’m lonely. Wondering what happened to the days of friends calling just to see how you’re doing. Oh wait, my friend just did that, kind of. Never mind about that one. I know I shouldn’t complain, I am so blessed and I am grateful for this rich, abundant life. But sometimes, I have bad days. I feel irritated, overwhelmed and sad. I hate to admit this, because they might think an intervention is needed. Well, maybe, as long as that intervention is prayer, or helping to relieve stress or an invitation to go for a walk. I guess this is me, apologizing for being human after all. But, then again, You don’t want an apology for my weaknesses, You just want me to come to You with them. And you already knew I was human anyway. It’s me who forgets that one. This tightly wound, try-hard gal is trying to learn this grace thing, but, wow, I sure have a hard time giving it and receiving it. Thanks for listening. 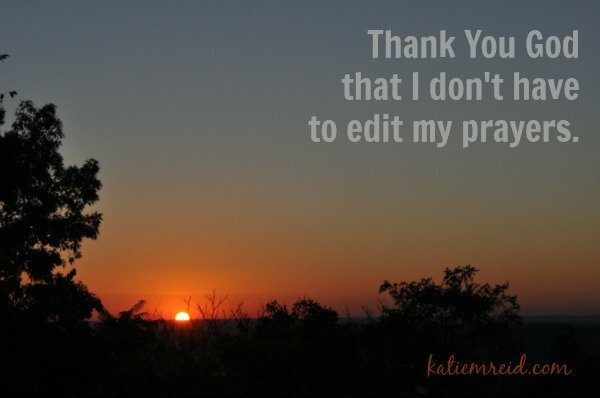 Too often I edit my prayers and try to pretty them up or talk myself into Christian-ing up my feelings. Then don’t have so many kids. Then don’t do so many things. But, I’m not listening, because You have called us to this, to these, and I’m glad. But, every once in awhile it’s just hard and I am glad I can tell You that too. I’m sorry I’m not stronger but, then again, I think You delight in the weak anyway. You love “as is”. And tonight, I’m banking on that. Thank for listening Pops. Thanks for being patient with your grown-up daughter who just needs to sit on your lap sometimes and tell you about all the feelings. Come back tomorrow for a special guest post from a new friend of mine. Me, too, Katie! I have a lot of really great things I am certain God has called me to going on and am in a busy season right now. Most people don’t understand that I can’t just lay down a commitment and walk away. I don’t want to complain about my blessings but sometimes it’s hard. Hugs to you! Thanks for commenting Liz. Praying for wisdom as you move forward. Love this Katie! I think we all feel overwhelmed at times. Don’t you love knowing we can just pour out our hearts to God – completely unedited! Thanks for the encouragement Melanie!